The most underrated movie of the 1970s? Bob Rafelson and Jack Nicholson's creative relationship began because of The Monkees. Rafelson directing and Nicholson writing their weird and wonderful psychedelic cult classic 'Head'. After that the two teamed up for one of the early Seventies best loved movies 'Five Easy Pieces'. A couple of years later they did it again with 'The King Of Marvin Gardens', though inexplicably it doesn't have the reputation or the high profile of their previous collaboration. I really fail to see why. File it under "great lost 1970s movies" alongside 'Scarecrow', 'Bring Me The Head Of Alfredo Garcia', 'Tracks', 'Fingers' (and add your own personal favourite to the list). Marvin Gardens features a really strong and controlled performance from Nicholson in the lead role, an introverted DJ with a show in which he spins "true" tales. But even better than Nicholson is Bruce Dern, a wonderful actor who never became a superstar like Nicholson, Pacino or De Niro, despite a long career of consistently good character roles in movies by Hitchcock, Roger Corman, Walter Hill, Hal Ashby, John Frankenheimer, Elia Kazan, Sydney Pollack and many others. Dern is absolutely wonderful as Nicholson's brother, a dreamer and Mob hanger on. He comes back into his brother's life with a nutty get rich quick scheme which ends up going horribly wrong. This is one of the very best performances by Dern I've ever seen, and his scenes with Nicholson make this essential viewing for any 1970s buff. Added to that are excellent performances from Ellen Burstyn ('The Exorcist', 'Alice Doesn't Live Here Anymore') and newcomer Julia Anne Robinson (her only movie role - too bad!) as the women in Dern's life, and nice bits from legendary musician/actor Scatman Crothers ('Black Belt Jones' and appearances in no less than four 1970s Nicholson movies) and the underrated John P. Ryan ('Runaway Train', 'It's Alive', 'Class Of 1999'). 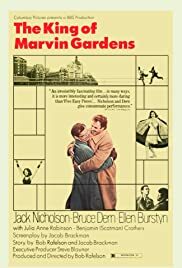 'The King Of Marvin Gardens' is a slow and thoughtful movie, but once you get into the rhythm of it, an extremely rewarding one. One of Nicholson's best, and Dern is just dynamite. Highly recommended. 55 of 63 people found this review helpful. Was this review helpful to you?